I've been pretty busy since late spring this year, working on many extracurricular projects besides my full time job. Most of that time was definitely spent on the book I've been writing together with my coworker Dejan Dakić. NuGet 2 Essentials is a comprehensive guide on NuGet, covering as many features as possible both for consumers and for publishers of packages. It starts off with basic instructions on setting up NuGet in different ways, followed by in-depth coverage of package consumption and related features, including source control and build server integration for readers working in larger development teams. 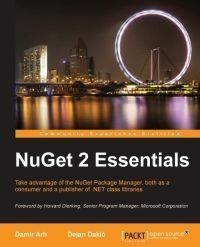 The second part is focused on creating packages, again starting with the basics of creating the very first package, but then guiding the reader through most of the package features available in NuGet 2.7, accompanying each one of them with a working example demonstrating how it can be used. The book concludes with a listing of different options for hosting your own NuGet package source or server, followed up by instructions on how to actually set it up. To sum it up, the book is an up-to-date complete guide to NuGet, written in a very concise and practical manner with many hands-on examples to learn from and to see the features in action. Since NuGet is now included with every edition of Visual Studio and serves as the release vehicle for many Microsoft's libraries, not only open source and third party ones, its importance for .NET development will only grow. Recent announcement of support for Xamarin platforms only reinforces this fact. As the book author, I'm of course biased, but I think currently it is the best available resource for learning about NuGet.